Aerators that pull out plugs of soil should be used, not one that just uses spikes. It is easy to think that the spikes will make holes that allow water and nutrients to reach the roots of your grass like any other aerator, but this is not true. The spikes don’t take out any soil with them, they just compact the soil even more which adds to the problem that we are trying to solve in the first place. Good lawn aerating actually removes plugs of soil so that it will be less compact. Your yard should be watered thoroughly the night before planning to lawn aerate, especially in Utah. Doing this will help ensure that the soil is soft and easy to work with. Aerating lawns becomes much more of a challenge if your yard is dry. Lawn aerating should be done most frequently in the areas of your yard that have the most traffic. When there is a lot of foot, car, and other traffic in your yard, lawn aeration can help quite a bit with problems such as slow growing grass and other resistances. Also, aerating your lawn sometimes has the ability to make weaker lawns more vulnerable to weeds and insects; therefore, a herbicide or fertilizer should be applied after aerating your lawn. When everything is done with lawn aeration, the plugs should be removed from your yard. There is a good chance that you’ve walked by someone’s yard that just finished lawn aerating and thought that some dogs had just been there. Get rid of any bad glances at your yard by neighbors and others. The plugs just need to be gathered up and thrown away, or broken up and removed by a lawn mower. 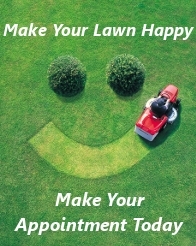 Follow these other simple lawn care tips.